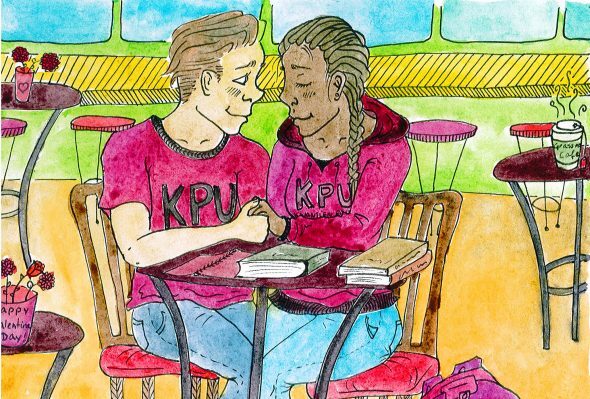 If you’re stuck studying at KPU on Valentine’s Day, or you want to escape the harsh reality of being single, there are a few things you can do on campus—aside from crying. Then again, if you’re at KPU on the most “romantic” day of the year, that’s a valid reason to cry. For all the lovely couples out there, here are some places on campus that can serve as your alternative Valentine’s Day destinations. They’re nothing compared to an all-inclusive resort in Puerto Vallarta, but hey, KPU can be your local resort. Good luck trying to suntan with the high possibility of rain in this goddamn city and attempting to drink a margarita in the courtyard. Let’s be honest: The courtyard is just about the least romantic setting on the Surrey campus, but if you’re low on the dough and you love the outdoors, a courtyard picnic lunch sounds dandy. If you really love the outdoors, you’ll even sit on the grass, unlike me. Fortunately, there are a few places where you can picnic with your love, particularly by the tables in the courtyard. You can even relax under the gazebo beside Surrey Main. To top it off, you can also buy some snackage at the bookstore for your “KPU style” picnic. Depending on your budget, you may want to splurge on a lunch date with yourself. I love to treat myself to food, especially when it’s from Grassroots. It may cost you a little more to buy food there, but it’ll be worth it. There are always delicious baked goods on display to purchase. However, if you’re feeling cheap, you can always grab something to eat at Tim Hortons. Why not add ten timbits to your meal? I hear the birthday cake timbits are back. Whether you’re studying for a midterm or are in desperate need of silence, the third floor in the KPU Surrey library is your go-to spot! You can even pretend to study in a cubicle and fall sleep, but careful not to snore because eventually someone will wake you up. You can probably find a cozy couch to sit on and watch Netflix. With the amount of chocolate on store shelves for Valentine’s Day, you’ve probably been tempted to buy more chocolate. If you have the free time to sneak a workout in between “studying,” why don’t you visit the KPU gym at the Surrey campus? Exercise is the best way to release any tension. Plus, it’ll help you burn off any chocolate, donuts, or candies you may have ingested within the past week. I’m speaking on behalf of a friend. Whatever you choose to do at KPU on Valentine’s Day, make sure you treat yourself in some way. You’re too precious to let another day slip without doing something spontaneous at KPU.